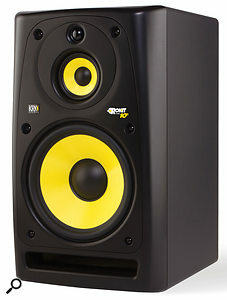 KRK's Rokit-series monitors, with their distinctive yellow cones, have proven very popular since their introduction. 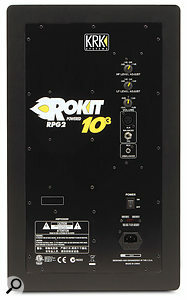 Most of the KRK models we've looked at have been active two-way designs, ranging from compact nearfield and desktop models to seriously substantial ones, but the new KRK Rokit RP10-3 is a three-way active design, intended to offer midfield monitoring performance (optimised for a listening distance of one to four metres) while still being sufficiently portable that producers can take their own pair with them when working in different studios. The design brief was to combine tonal accuracy with enough power and bass extension to keep both producer and client happy, even when auditioning challenging material with a wide dynamic range and significant low-end content, such as dance music. Although it is designed for midfield use, the RP10-3 may also be used as a nearfield speaker. The speakers measure 540 x 325 x 365mm, and weigh 21kg each, so they're fairly substantial. The MDF cabinets and the moulded baffle sides have a rounded shape to reduce cabinet-edge diffraction, while the slot-shaped bass ports are at the bottom edge of the baffle, to avoid the problems that can occur when rear-ported cabinets are positioned close to a wall. The port opening is also nicely rounded, to minimise port noise or 'breathing'. The one-inch, ferrofluid-cooled, soft-dome tweeter sits in a shallow waveguide that flares out to the front baffle, and the four-inch mid-range driver is located just below, again with a smooth transition from the driver edge to the baffle. The low end is handled by a substantial 10-inch driver, and both the bass and mid-range cones are fabricated from KRK's familiar yellow aramid-glass woven composite material, combining light weight with stiffness. The rear panel houses all of the RP10-3's input connectors, plus controls for HF and LF level, and input sensitivity. A key design point is that the whole of the circular baffle section that houses the mid driver and tweeter can be rotated through 90 degrees, so that the speaker can be used on its side without detriment to the width of the sweet spot — a nice touch. Rotating the baffle involves first removing the baffle fascia (held by six screws), and then removing the screws securing the rotating baffle section to the main baffle, so it isn't something you'd want to do every day. Essentially, this arrangement allows the tweeter to sit directly above the mid-range driver when the speakers are in either orientation. Having the woofer directly below the mid-range driver (as is the case when the speakers are mounted upright, but not when they're on their sides) isn't as important as having the tweeter and mid-range driver aligned vertically. This is because the woofer only handles low frequencies, and these low frequencies have long wavelengths, which makes the relative positioning of the low-frequency driver less critical. Power comes from three traditional Class-A/B analogue amps, delivering 30W each to the mid-range and HF drivers, and 80W to the bass driver, with crossover points between drivers at 350Hz and 3.5kHz. The outcome is a 31Hz-20kHz frequency response, at SPLs of up to 113dB, which approaches what some PA systems generate! The speakers have thermal and over-level clip protection built in, with the illuminated KRK 'power-on' logo changing to red in the event of the protection kicking in. To facilitate worldwide use, the supply voltage setting can be changed by the user to operate at 110-120V, or 220-240V (at either 50Hz or 60Hz). The voltage selector is located around the back, by the power switch. The rear panel also hosts both low- and high-frequency level controls, to adjust for room acoustics and placement. The HF level can be set to -2dB, -1dB, 0dB or +1dB, while the LF settings are -2dB, -1dB, 0dB and +2dB. There's a wide-range input-level trim (-30 to +6 dB), and connection may be made via balanced XLR, balanced quarter-inch jack or unbalanced RCA phono. Setting up the Rokit RP10-3s alongside my own studio monitors involved a little moving and juggling, but once that was done, the speakers powered up with no fuss. They are quite heavy, but would still benefit from being set up on isolation platforms, ideally the type with a heavy mass on top, such as a stone slab or steel plate, as this helps keep the bass end under control. Because of the three-way layout (see box below) and the powerful woofer, there's plenty of depth to the low end, with little obvious time smearing caused by the port, not to mention more available level than any sane engineer would normally require. I've always felt that KRK speakers have a slightly forward character which, while not, strictly speaking, absolutely honest, does make them very good at revealing detail within a mix. This isn't to everyone's taste, but I have no problems mixing on them. This model has that same family character, yet it doesn't suffer from a harsh top end — no doubt this smoothness is due to the use of a soft-dome tweeter. When the RP10-3s are used in the nearfield, the stereo imaging is flawless, with a better impression of front-to-back perspective than I hear from most monitors. There's also a strong sense of separation between instruments, and the impression that everything is somehow perfectly in focus. As intimated, this may not be exactly accurate, but it does make the RP10-3s very useful mixing tools, even if you feel you have to do a confidence check on smaller speakers. In some ways, I thought these speakers came closer to the clarity of headphone mixing than many monitors I've used to date. The only caveat is that their ability to separate sounds in a mix is so good that they might lead you to believe that your mixes are actually clearer than they might seem when played back on less revealing speakers. Best of all, though, I had to do a double-take when I found out what these speakers were selling for. It turns out that they cost little more than many popular two-way speakers! While they're perhaps not the best choice for a small room, if you have a little more space available and need that extra power and low end — for example, to mix dance music or heavy rock — then the KRK RP10-3s represent a very practical option, especially if you can't afford high-end, esoteric three-way speakers. I have to say that, taking everything into consideration, I was very impressed with what KRK have managed to achieve at this price point. There are very few three-way models on the market at this price point. Most comparable designs are more expensive, and come from manufacturers like Focal, Neumann and Adam. When higher SPLs and greater bass extension are required, larger-diameter woofers offer the advantage that they can 'push more air'. But if they're used as part of a two-way design, there comes a point where the vital mid-range suffers. In any two-way system, the mid-range is covered by the upper end of the woofer and the lower end of the tweeter, and in designs using smaller woofers, the upper reach of the driver may overlap fairly comfortably with the lower reach of the tweeter. However, larger woofers, being heavier, are less effective at reproducing high frequencies, so when you get to a 10-inch woofer like the one used here, the 'best compromise' crossover point would see the woofer trying to work at higher frequencies than those for which it was designed, with the tweeter struggling to go low enough to meet in the middle. The only way to avoid this problem is to add a third driver to cover the mid-range. This may either be a smaller cone driver, as it is on these KRKs, or a larger dome device, as used by makers such as ATC and PMC. Using three amplifiers and two crossovers means that each driver can be fed only with the range of frequencies that it is able to comfortably handle, which is why KRK designed these speakers the way they did. This arrangement allows the mid-range driver to handle all those crucial mid-range vocal and instrument sounds without straining to also produce the highs and lows, the result being lower distortion and generally better clarity. Plenty of level and clean bass extension available. Their excellent sense of separation might make you think your mixes are better in this respect than is really the case. The Rokit RP10-3s perform very well given their price, though you may wish to double-check your mixes on less revealing speakers once you've done all the forensic mixing work. £1030.80 per pair including VAT.